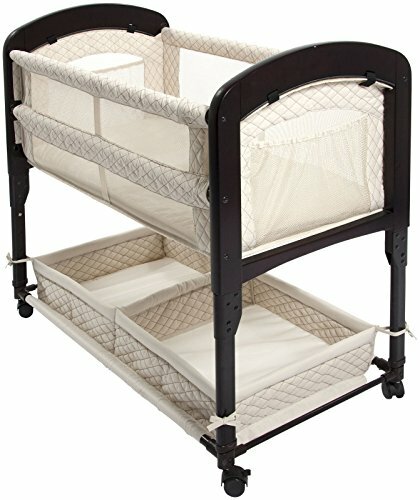 A bassinet is a raised baby basket where you can place your baby when he/she is asleep. It is suitable for newborn babies who are 2 months old or below. The best thing about these units is that they are very comfortable and safe for the child. If you are a new mother and you do not know anything about bassinets, you may take a lot of time trying to get your baby to sleep especially during the first months. These ones are lightweight and you can easily attach them on your bed so that you can access the baby easily. You can also place them directly beside the bed which enables you to feed and tends the baby more conveniently especially at night. This one is a large woven basket which comes with handles. It contains a padded insert which is covered with a mini sheet. It also has a shade that can cover the bassinet completely. One of the best things about classic bassinets is that they are lightweight and can be taken from one room to another without problems. However, they are bulky and not easy to fold. These ones are lightweight and you can easily move them from one room to another. Most of them have a foldable design which makes them a perfect choice for parents who travel frequently. They are also easy to store due to their design. These ones are usually designed for twins. They come in different designs to make your work easier when tending to your twins. Incline bassinets are suitable for infants with acid reflux or gas problems, especially at night. They allow the kid to sleep at a reclined position. This one is also known as a transitional bassinet. It is a Pack-N-Play unit and it features a removable bassinet that is attached at the top. When your baby grows up and no longer needs the bassinet, he can use the playpen area which has a larger sleeping surface. It is very easy to fold which makes it portable. This one is normally placed on a stand with legs that can be folded to form a can roll or a tripod. 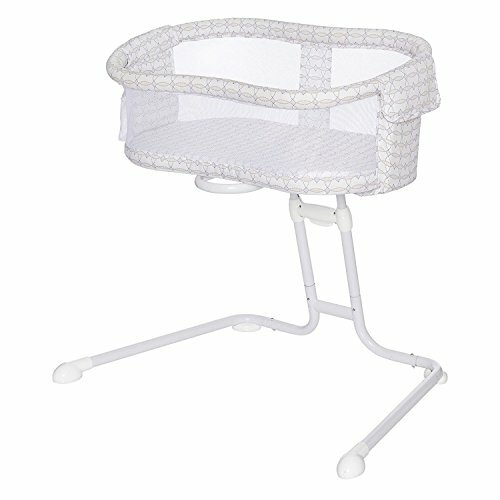 The raised bassinet acts as a resting place, dressing area, bed or a diaper station. The best thing is that you can easily adjust the height. Some of these bassinets come with inbuilt rocking legs. These ones are very advanced and they can even detect when the child is crying. They respond with gentle rocking and white noise when the baby is crying. Here are some of the factors you should consider if you are searching for a high-quality baby bassinet. Mattress – The mattress should be stiff and hard. A mattress that dips in when the baby is lying on it might lead to a blockage to a baby’s airways. Portability –Look for a lightweight bassinet which you can easily move from one room to another. Most of the bassinets come with wheels to enhance portability. 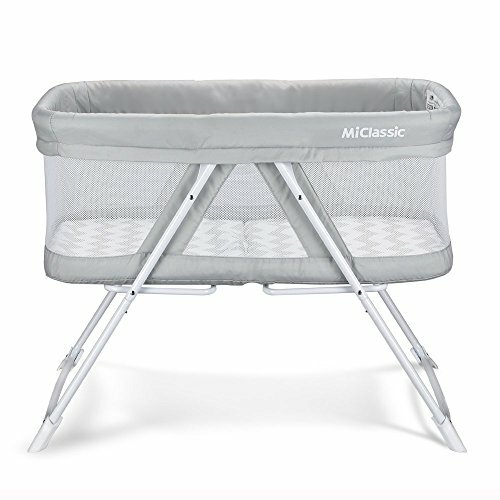 Mesh walls – A meshed bassinet should be a top priority when buying. These units allow the baby to breathe easily when sleeping on the sides. Safety – The product you have selected should have a safety seal to prove its quality. It should be certified by either ASTM[ American Society for Testing and Materials] or JPMA [ Juvenile Product Manufacturers Association], unlike baby hammocks. Sounds – Some bassinet comes with music and vibration features which ensures that the baby is always active. This is very important for the development of the child. These bassinets use removable batteries and you must ensure that the batteries are long lasting. Storage – A good bassinet should have a built-in storage location where you can put different items for the baby. Price– Do not just buy a baby bassinet simply because it is affordable. What matters most are the features. Ensure that it has all the necessary features that will make your baby comfortable. If you are searching for the best baby bassinet, this might be an excellent choice. It is lightweight and features a rock mode and has a stationary option which enables you to put your baby at ease. Apart from that, it has a big internal area and features an outstanding one-second open and fold system which allows you to move easily with the kid. It also has a mesh lining at the sides which gives you a clear view of the baby. The mesh allows the baby to breathe easily when lying on the sides. If you are on a budget, this one is among the best you should consider since it is affordable. It measures 37.5 X 23.8 X 28 Inches. However, you should note that it does not have a storage space. In addition, it comes with a waterproof mattress pad which is supported by the frame at the bottom. It also has a removable cover and a carry bag. The product meets all the requirements of CPSIA and CPSC standards. Additionally, it is sturdy and easy to fold. The internal area provides a large area which is convenient when changing diapers. This one is among the most affordable options you can find out there. It is very effective and the metal frame prevents you from rolling onto the baby. You will also find that it has a mesh along the sides which allows the baby to breathe comfortably when they roll into the sides. Additionally, it gives you a clear view of the baby even without sitting upright. Another thing is that it is easy to use though it might be a bit hard to access the infant. It also comes with a waterproof mattress and a cover which is easy to remove. The fabrics are very easy to clean. You can just wipe with a wet cloth. You can also clean the sheets in a machine. The replacement sheets are also affordable. If you are searching for a portable bassinet, this one might be the best. It is lightweight and easy to move. Apart from that, it is collapsible to provide space. You can share the bed with your little one without any problem. However, it might not be the best if you have a limited space on the bed. If you are searching for an affordable option, Delta Children Sweet Beginnings is one of the best baby bassinets you should consider. It is affordable and very easy to assemble. It weighs 10.5 pounds and it is suitable for infants with up to 15 pounds. The sleeping area is very comfortable for the kid since it is made of soft materials. The best thing about it is that the frame is made of steel and it also comes with a soft polyester fiber pad. The frame is lightweight to enhance portability. In addition, this product features locking casters which boosts mobility around the room. It also has two large baskets where you can keep the baby’s items. You should also note that this bassinet meets all the CPSC and ASTM requirements. The unit also features an electronic music module and also produces gentle vibrations. It is a very effective unit and helps to promote proper sleeping habits for the infant. It has a nice appearance and does not occupy a lot of space. This one has a very nice design and saves a lot of space. You can easily tuck it under your bed in a way that allows your kid to sleep next to you. This helps to minimize the risks that might occur due to bed sharing. It also features retractable sidewalls which lower easily. This means that you do not need to get out of the bed to tend to your baby. You can also lock the wall in an upright position if that is what you want. Another thing is that it glides smoothly on any floor surface including on a carpet since it is lightweight. Gliding discs prevent scratches or any damage to the floor. However, ensure the discs are clean since debris trapped underneath the gliding discs may cause damages to the floor. Its simple glide motion enables you to move out of the bed more easily as compared to other bassinets. It is made of polyester which is easy to clean. You only need to wipe using a damp cloth. It also comes with storage pockets where you can keep different items. The mattress is also waterproof and does not have any toxic flame-retardants. It is suitable for babies with up to 20 pounds. The best thing is that it meets all the recommended standard of the US Consumer Products Safety Commission. This one has a nice pink color and it is suitable for a baby girl. Apart from the color, it comes with very attractive features, unlike others. It has a stylish design and it has some wheels which make it easy to move. It also comes with a padded mattress to provide the required levels of comfort. It has a very strong frame to ensure that the baby is well protected. The mattress has a machine washable cover which is very important for the baby’s hygiene. Additionally, it features different melodies and sounds which helps the baby to sleep for a long time. Apart from that, it has a vibration function, unlike other cheap bassinets. You can set these sounds and vibrations for a maximum of 20 minutes. They are able to shut off automatically after which helps to save the battery life. 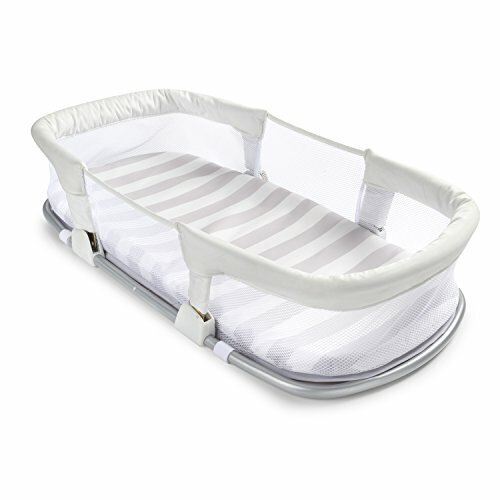 Another impressive thing about Summer Infant Soothe and sleep bassinet is that you can adjust the canopy easily. Bright light can prevent your kid to sleep. To avoid direct light, you just need to pull the canopy over the infant’s head. You can store various items on the storage space provided. 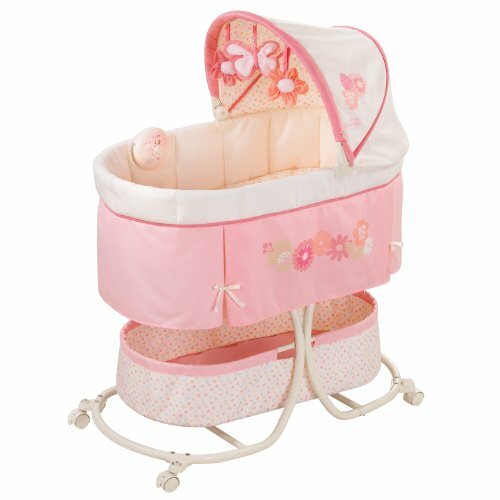 This one is another best baby bassinet which comes with very outstanding features. 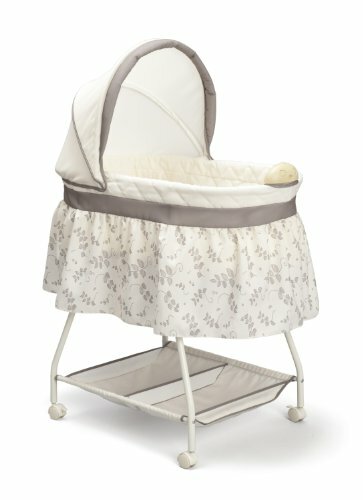 The best thing about Graco Dream Suite Bassinet is that it can also be used as a changing table. All you need to do is to squeeze and flip the upper part of the bassinet to access the changing table. The feature is very convenient for the parent especially when you are changing a diaper since it can be hard to do so when the baby is in the bassinet. Kids with up to 30 pounds can use the changing table. This means it even out-lives the bassinet which is only suitable for baby with up to 15 pounds. 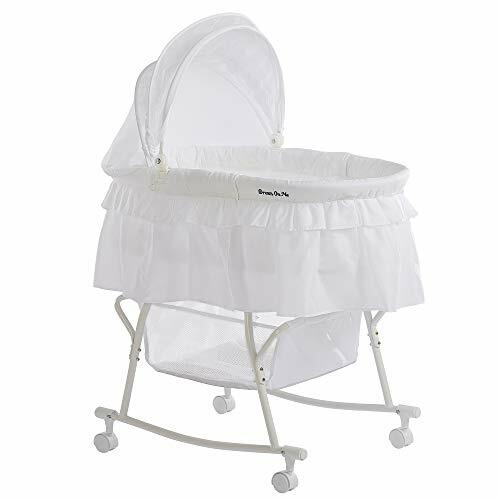 Apart from that, the bassinet is made of soft materials which are very easy to clean. You should also note that it comes with a canopy and two soothing vibration settings. Additionally, it is very strong and comes with a convenient storage area at the bottom. Another thing that parents love about it is that it features locking wheels which allows you to move it easily. The mattress is also firm and suitable for a newborn. You should also note that the sides contain a mesh which enhances breathability. It is very easy to assemble. If you are one of those mothers who prefer to sleep next to the baby within the first few months, Arms Reach Concept’s Cambria best baby bassinet would be a perfect choice. You can easily attach the unit to your bed. It comes with a neutral color which is ideal for your little boy or girl. Unlike others, it has nice curved wooden ends which give it an attractive look. In addition, it features four stable wheels which allow you to move it easily. The wheels also have a break to enhance safety. It also has a perfect size and you can easily reach your infant from your bed. You do not need to worry about your baby’s safety since it is one of the most comfortable and safe bassinets on the market. It also has a mesh along the lining to boost breathability and visibility. Moreover, it has a wide storage space under the unit which promotes orderliness. The storage is divided into two which allows you to keep the items organized. It fits perfectly on beds with a measurement of 24 inches from the top to the bottom. You will also note that it is ideal for both small and large rooms since it does not occupy a lot of space. This is another amazing baby bassinet on the market. 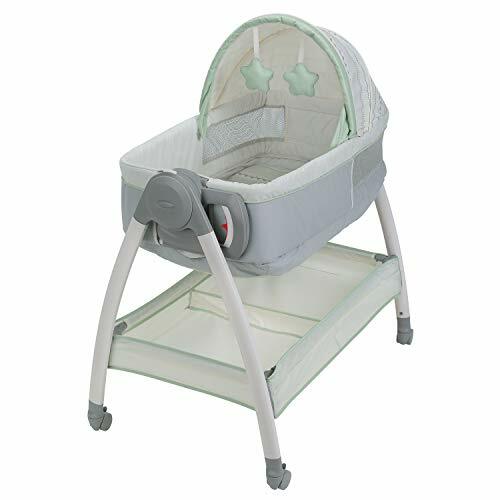 The Rock ‘N Play bassinet manufactured by Fisher-Price designed to provide your little one with the comfort that is beyond compare, its gentle motion that helps him/her to fall asleep fast. The product is beautifully designed to add color and style to your home decor. It is designed to cater to the needs of both male and female babies that weigh up to 25 pounds. Interestingly, the product gives you an option to either lock the push for a rocking motion lock the feet to keep it secure and still. It is easy to assemble and easy to move from place to place since it is lightweight and portable with a weight of about 7.5 pounds. Storage may also not be a problem since the product is foldable and it has a dimension of 33.2 x 22.5 x 24.5 inches. It is ideal for both indoor and outdoor use. The product is budget friendly and it ships with an inbuilt mirror and rattle to keep your little one busy. Maintenance will probably be easy since the bassinet is made of plastic that is easy to clean. The pads also support machine cleaning. However, some users who do like the integrated mirror complained that it is not detachable. Others state that the product is too tight for their babies. Also, the pad shrinks after wash. The Dream On Me Karley baby bassinet is a top quality product designed to cater to the needs of babies that weigh up to 25 pounds. The product is ideal for newborns, infants and toddlers alike. It features a modern design that will go a long way to add style to your home decor. Also, it is available in 7 different colors thus giving you an option to go for the one that works best for you. The product is lightweight and portable. With a weight of about 13.95 pounds, one may safely conclude that the bassinet will be easy to move from place to place. Storage will also be easy since the product has a dimension of 26 x 5 x 5 inches. It is easy to assemble and the entire process may be completed within a few minutes without the need for any special tool. The product is ideal for both indoor and outdoor use thanks to the double canopy that ships with it. The canopy may be useful in keeping bug and dust away from your little one. It is cheaper compared to similar bassinets on the market. However, some users complained that the canopies are not easy to detach. Others state that it is difficult to find a sheet that perfectly fits the product. When you are preparing to welcome a newborn baby, one of the most important baby gears you should purchase is a baby bassinet. These units are more convenient than cots since they do not occupy a lot of space. They are also portable and very comfortable. Modern bassinet comes with advanced features such as vibrations and sounds, swivel among other important features. However, you must be very careful when buying to ensure that the bassinet you have selected is of high quality. If you are not sure of which one to choose, you should consider any of the products we have reviewed. 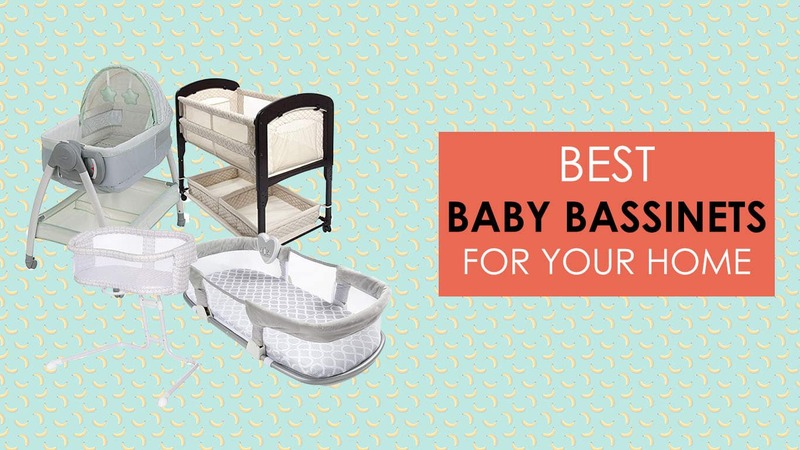 We have also outlined some of the factors you should consider when buying and we believe that with the above information, you will be able to identify a quality bassinet for your newborn baby.